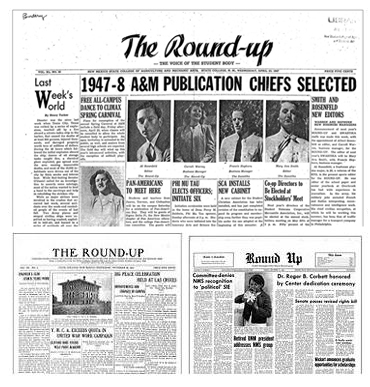 New Mexico State University's student run newspaper, The Round-Up, and its predecessor, The New Mexico Collegian, are not only the central source of readily available material on the history of NMSU, but also an important source of regional history. The student newspaper has been published since 1893 and it is one of the most highly requested resources in the Archives' collections at the NMSU Library. In 2009, due to the increasing fragility of the original newspapers, the Archives and Special Collections staff had to restrict access to them and was no longer able to permit photocopying of the early issues. Restricting access to this kind of historical information is detrimental to researchers, so NMSU Library committed to raise funds to digitize the newspapers from 1893 - 1999. Thanks to the most generous contributions of the following organizations and individuals, issues of The New Mexico Collegian and The Round Up from 1893 - 1999 are now searchable online.